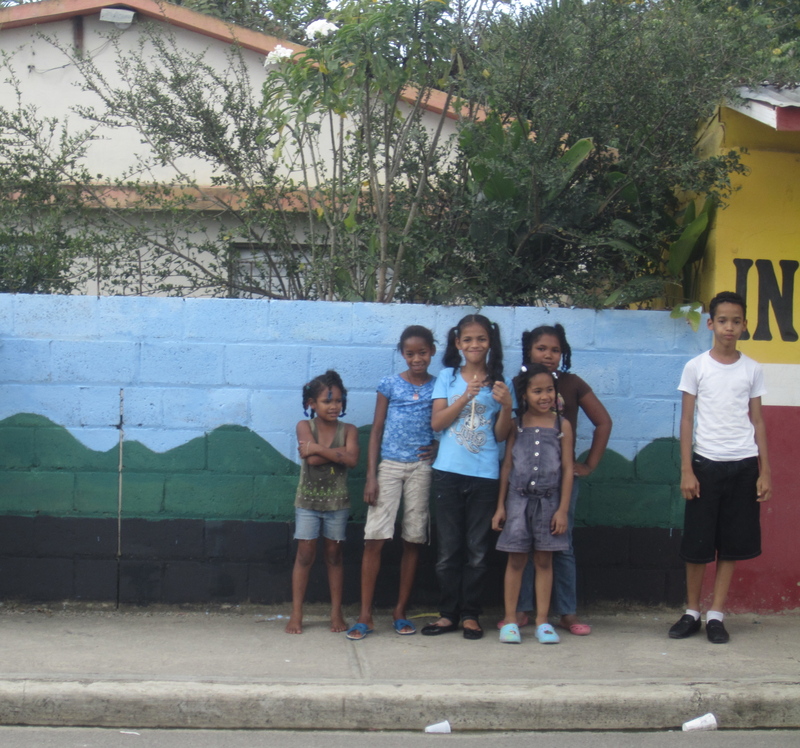 Today we held our fourth mural painting session with the children of La Vereda. Our new system was mucho mejor! I am so happy we figured this out. Like most organizational concepts, it was pretty simple. As the children arrived we had them sign their name on a list. The first 5 students would paint for 30 minutes, then the next 5 and so on. 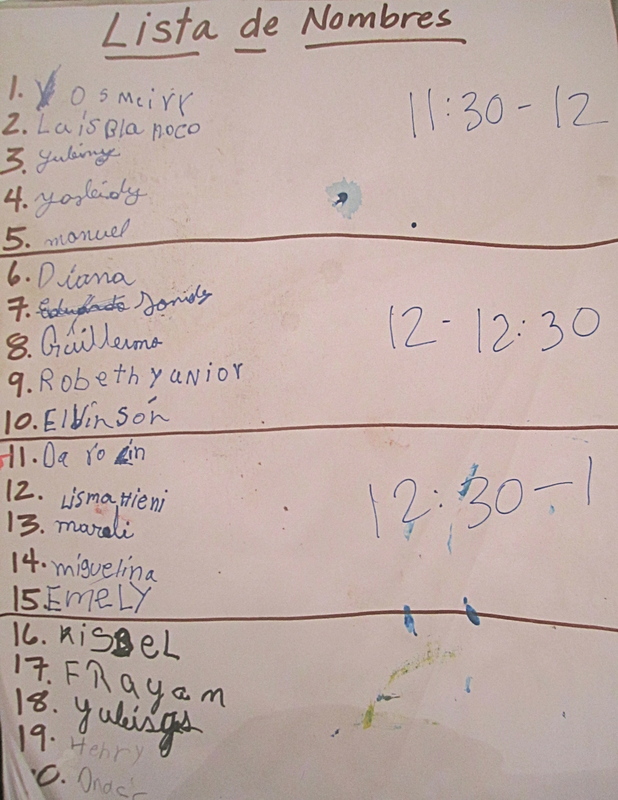 We told each child what time their painting slot was and asked them to come back at their scheduled time. Almost all of them were happy to comply with the new system though there were several very persistent little cuties who just could not contain their excitement enough to leave and come back, but instead insisted on hanging around until it was their turn. Lol. We tried our best to keep them in the shade since it was so hot! In any case the new system was delightful, allowing for so much more organization and the small group made working more pleasant for the children, as well as us. There were beautiful moments of little voices chattering about their painting, and even moments of silence as the children found that wonderful space inside the creative process where one is in the so-called “zone” or engaged in what we can also call “flow”, a theory proposed by physchologist Mihaly Csikszentmihalyi. You can read more about the concept of “flow” here. One of the great parts of the day was the interest of passerby, neighbors, and family. We had quite a few people stop to watch and admire the children working. Some were surprised the children had done all of the painting on their own. We also had a few children we’d never met before pass by and ask if they could participate and because our new system was so efficient it was much more easy to include anyone who expressed interest. It was really super to feel enthusiasm for the project from the community. Children painting. Notice the three passerby who stopped to watch us work. The children did such fantastic work with the mural! They started out by fixing up some spots from our last session. 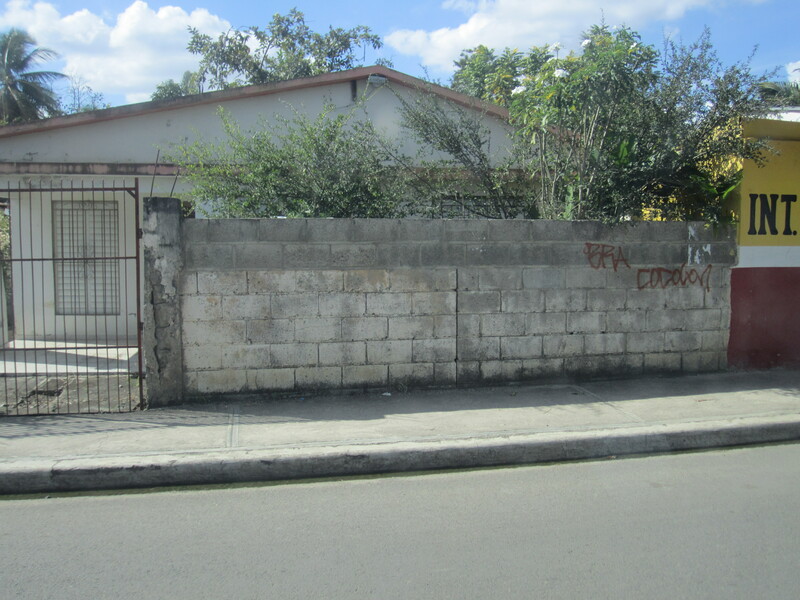 Then they added casitas, matas de coco (coconut palms), and a mata de mango (mango tree). 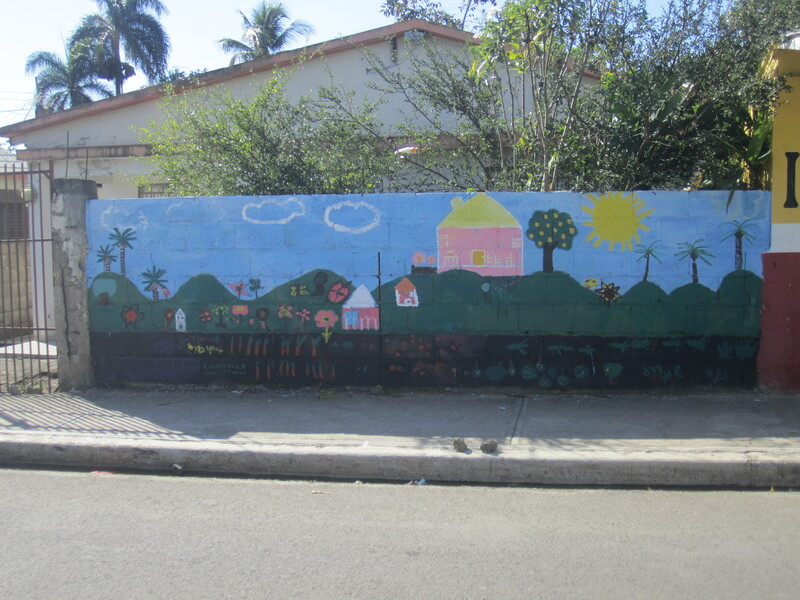 The wee little ones did a great job adding fruits and veggies to the “tierra” layer of the mural. 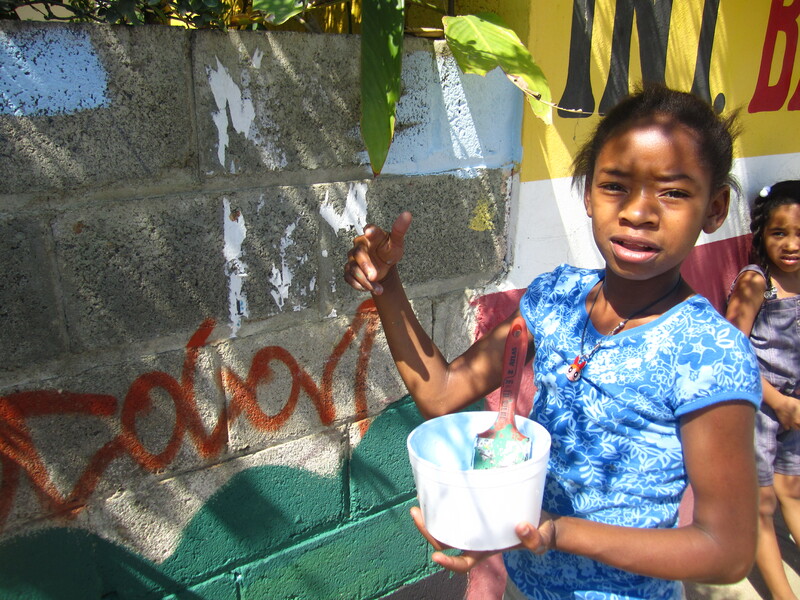 They painted zanahorias (carrots), cebollas (onions), yucca (cassava), tomate (tomatoes), and calabaza (squash). 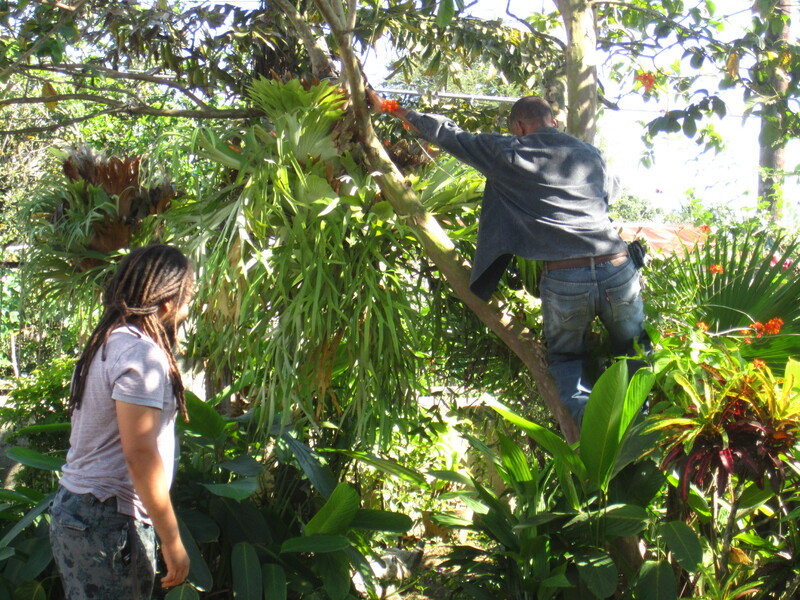 One of my favorite things about Dominican culture (and Carribean culture in general) is how ready and willing people are to climb just about any tree to procure fruit! No one around here ever seems too tired or busy to hoist themselves up a tree to grab you something tasty. There’s something so free-spirited and generous about this characteristic of the culture that I think is very special. Think about that the next time you feel too tired to get off the couch to get your sweetheart a tasty treat from the kitchen! Jaja. As we were about to leave with our guayaba (guava) I told Renzo I was craving agua de coco (coconut water) and I asked if he could find out from Victor where we could get some. Earlier in the day we had seen some vendors passing by but we were too busy painting with the children to bother with buying any. 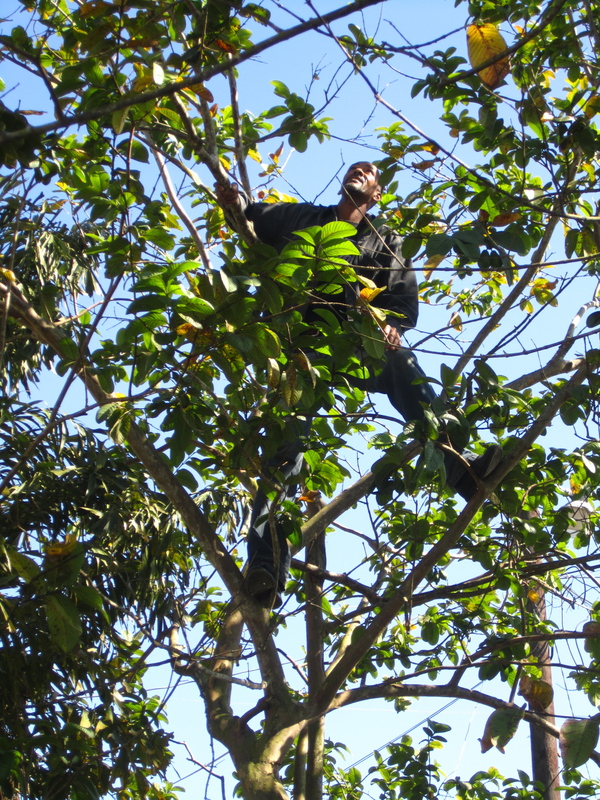 Of course Victor’s response was something along the lines of “Why buy coconuts, just go out back and get some off the tree.” So another tree-climbing venture ensued, though this time help was enlisted from Renzo’s very-skilled-at-tree-climbing cousin. He must have knocked down about a dozen coconuts for us to take home. 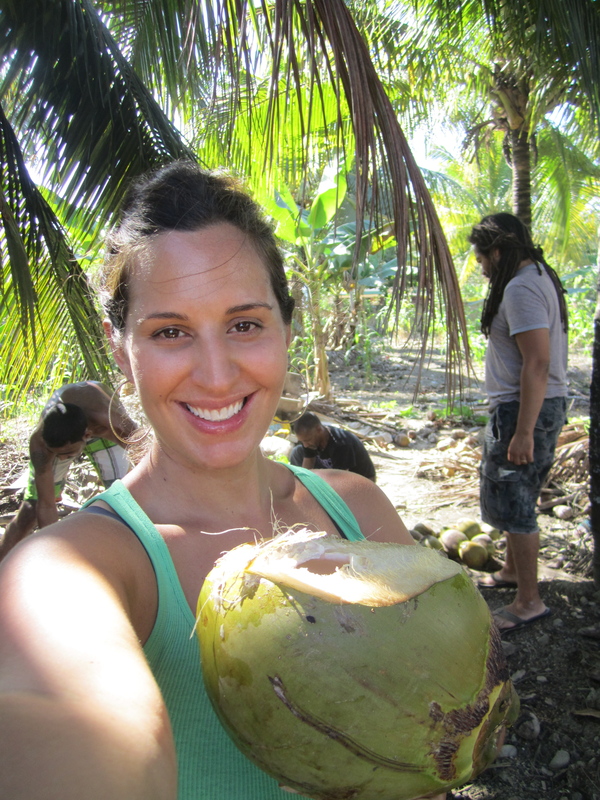 (Did I mention Samba LOVES coconuts? Playing with them, eating them, drinking from them…they are his favorite tropical doggie toys!) The one they opened for me was soooooooo sweet and delicious! I am really savoring these special moments with such little time left here. All in all it was a beautiful day. 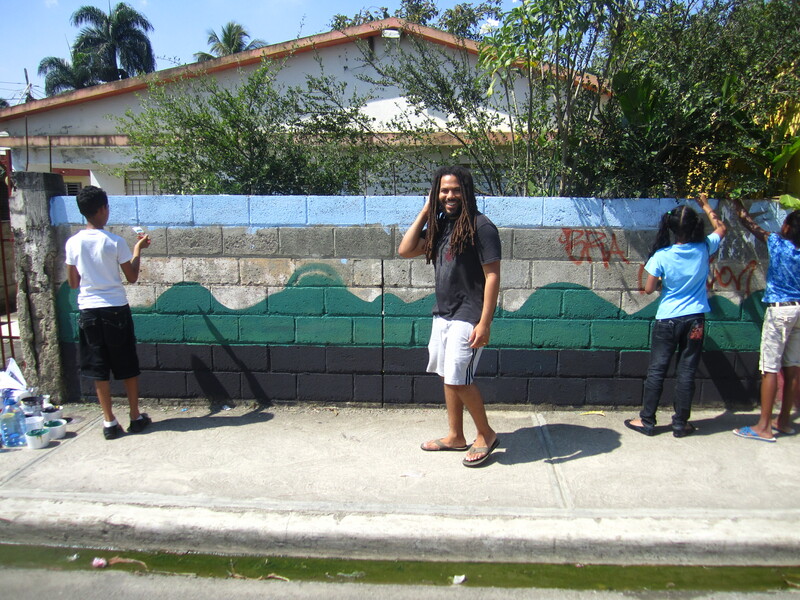 I never knew this before but working on a public community mural (with kids no less) can be really tricky! I’ve only ever facilitated mural-making teaching inside the classroom where you’ve got a certain degree of control over the environment, and can kind of manage the pace of the work and assist kids with thinking about composition and details. This is a whooooollllle different ball game. First, we are working on a fairly trafficked and often noisy street. It’s not like the constant type of background traffic type noise you find in NYC. It’s like short clips of relative quiet pierced with the REALLY LOUD BUZZ of the frequent motoconchos (motorbikes) and trucks grinding by. So loud that you really can’t hear what the person next to you is saying. On top of that, all of the kids in our class plus practically every kid that walks by wants a chance to paint, and it’s really had explaining to a 6 year old whose language you don’t speak very well that there’s “Just no more space at the moment but if you come back Saturday I promise you can have a chance then.” I am beyond thrilled that the children in the neighborhood are so excited about the project- in fact I hoped exactly that would happen, but managing so many kids painting all at the same time has it’s challenges. We don’t really have much set-up time because as soon as the children see us pull up in the car they get so excited, they immediately round up all their friends and before you know it we’re practically swarmed with kids eager to look, see, touch, grab, do, etc, etc. Getting the children involved in the set-up is something we are trying to get better at, but the seasoned teacher (me) is still learning the language, and though the laid-back musician does the best he can things easily get lost in translation, and as all teachers (and plenty of parents) know- timing is everything when organizing large groups of kids. Did I mention that Renzo is related to almost everyone on the block in some way? Well, it’s pretty easy to recognize the guy with the funny hair, and despite the fact that we can have a mob of impatient children waiting for paint, or needing a paintbrush, or we finally have them all listening to instructions, every so often someone passes by and decides that it’s the absolute PERFECT time to catch up and have a conversation with him about his studies, the weather, the meaning of life, & what have you. I kid you not but he’s actually been handed a beer while we were teaching our class! So when we met up with the children yesterday evening, it was just kind of par for the course that there was a dark gray rain cloud kind of hanging over our heads the whole time. We assessed the cloud situation (being the rain experts we are now having lived in Santiago for a few months) and just said let’s go for it and hope for the best. We got lucky and the weather held out enough for us to work for a good 40 minutes or so before we had to do a mad rush to pack everything up before the rain came down. It was pretty chaotic with about 12-14 kids working at the same time. It definitely wasn’t the way I would have preferred to structure the activity (laughing at the word structure here) but the kids who showed up had been waiting since Saturday to paint, and with the impending rain there wasn’t time to rotate small groups so we had to wing it. We focused on painting trees (matas) and flowers (flores) and a sun (sol). Despite the craziness I’m happy that the kids enjoyed themselves and love the work they did. I know this is how murals grow..in little layers and spurts. Our next session is this weekend and we are almost definitely going to have an even larger group show up. 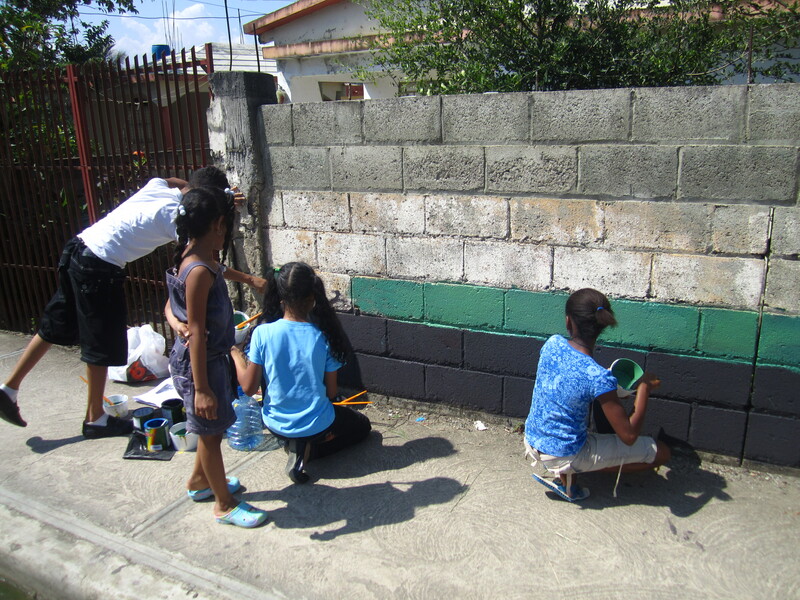 (When we were painting on Tuesday lots of new kids passed by and expressed interest so we just told them to show up on Saturday). Don’t laugh- but I have a plan to have kids sign in then give them give them a number. Numbers 1-6 will paint for the first 30 minutes, 7-13 the next half hour, and so on. The great thing is that they all live so close by that if they’re scheduled for a later painting group they can easily go home and come back when it’s their turn, and we don’t mind being there all day if need be. I have no idea if this is going to work…but it’s the only way I can think of to accommodate all the children without having total chaos. I know for sure the smaller groups will make for a more enjoyable experience for everyone. Can’t wait to see what happens at our next class! As many of you know our time in DR will soon be coming to a close. I really wanted to tackle a large group project with the children before leaving, and I just kept feeling like a mural would be the perfect project. I love the idea of the children creating something lasting and beautiful in their own community, especially something so public allowing them to share their pride in their work with their families, friends, and neighbors. 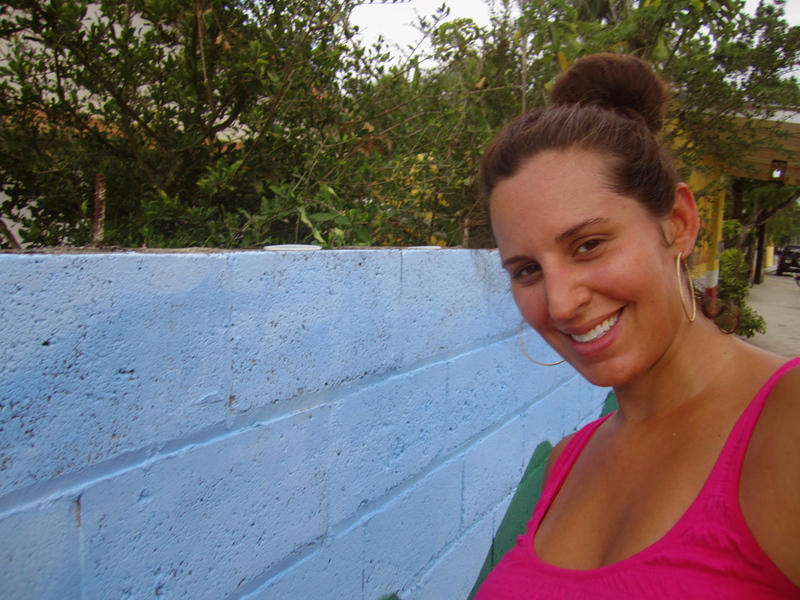 Taty was kind enough to grant us permission to paint on the wall outside her Papa’s former home. The wall is one the children walk past every day, so it was the perfect site! One of the biggest challenges to getting the project off to the right start was thinking about a theme. I wanted to find a theme that would capture the children’s imagination, but at the same time it would have to be able to be orchestrated in such a way that it would look beautiful to members of the community. In addition, the management of the project had to be thought through carefully because my command of the language is still pretty basic there would be some limitations on how much direction I’d be able to provide given that there would be times Renzo wouldn’t be around. Lastly, the class is composed of children ages 3-12 so there is huge age range, and I definitely wanted to construct a framework for an idea that would be inclusive of many different ages and skill levels. For awhile I played around with ideas that “sectioned” off a part for each child to work on, but ultimately I knew a design like that would not read as beautifully as something more cohesive and layered. After lots of going back and forth, Renzo and I finally decided on a “garden” theme. Many of the items from the children’s paintings of “things they love” could be found in a garden, we’ve been working on a garden, and where the children live there are lots of plants and fruits growing so they would have a lot of prior knowledge to work with. We don’t have a printer here, so we headed out to the local internet cafe to print some visuals for the lesson. They only had a b&w printer so we just tried to pick some shots with good shape and constrast. Then I realized we had plenty of gardening books here with us, so I bookmarked some pages, and we headed out to find a place that would make some color copies for us (in case you were wondering they don’t have kinko’s here!). It wasn’t so easy to find a place, though our search did bring us to an interesting part of town. We eventually found a cluttered little shop selling school supplies that were willing to do the copies for us, but they charged us an arm and a leg and the copy quality was pretty poor. It was color though, so we took what we could get. Robert finally had a chance to cut the wood that had been sitting around for a sculpture project I had planned about a month ago. I had moved on, but it seemed like he and Luz were hoping we still wanted to the wood so they could claim that part of their backyard again, so Renzo and I decided to split the group this week, with the older ones helping to start the mural and the little ones staying behind to work on wood sculpture. We figured we’d work out a schedule so everyone would have a chance to paint at some point. It would be way too crazy having 15 kids painting at the same time anyway so it worked out for the best. 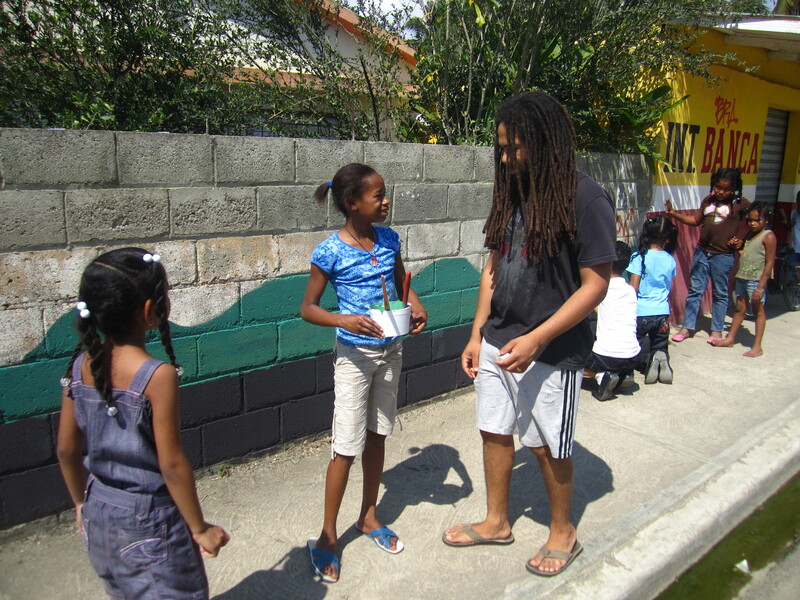 When the group arrived we showed them some images, asked them some questions, and spoke to them about the mural project. 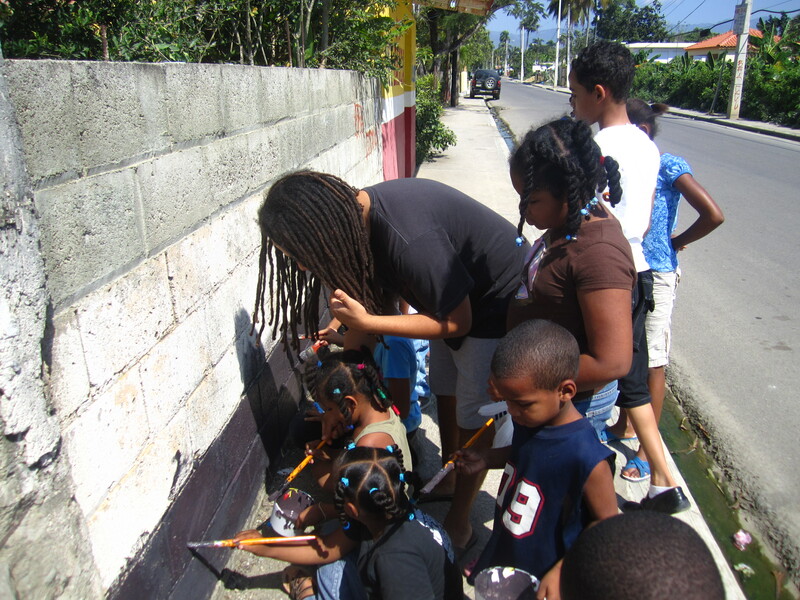 The younger ones got to work with the wood while 3 of the oldest children and I headed a few houses down to the mural site. The pressure was totally on! I did my best to talk with the children about the theme, the elements of composition and asked them how theythought we might start. All in Spanish. (There was a lot of pointing and saying “como se dice?”) It was a pretty amazing feeling to be able to communicate with them on my own without Renzo’s help. Children are so forgiving when it comes to language. They are really the best language instructors of all. Gracias ninos! 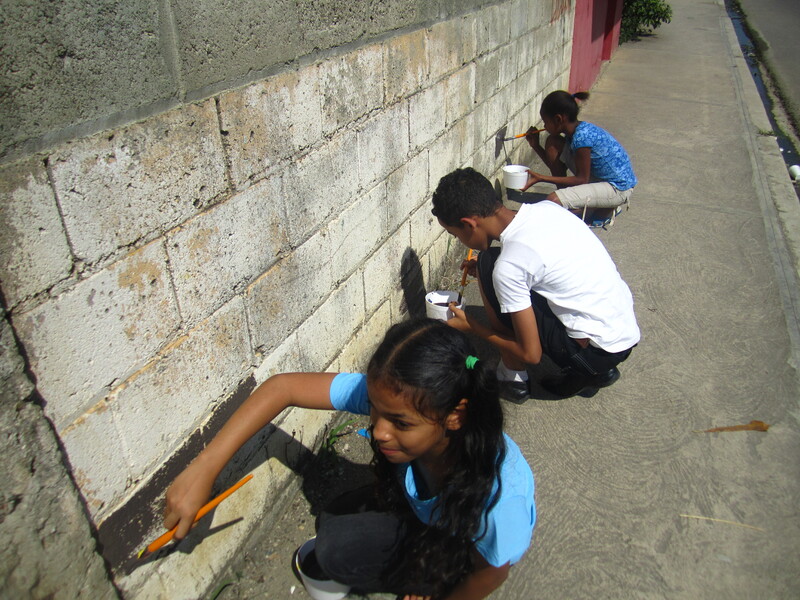 Diana, Guillermo, & Miguelina painting "La Tierra"
Adding the green for grass & shrubs. The younger children come by to check out our progress. 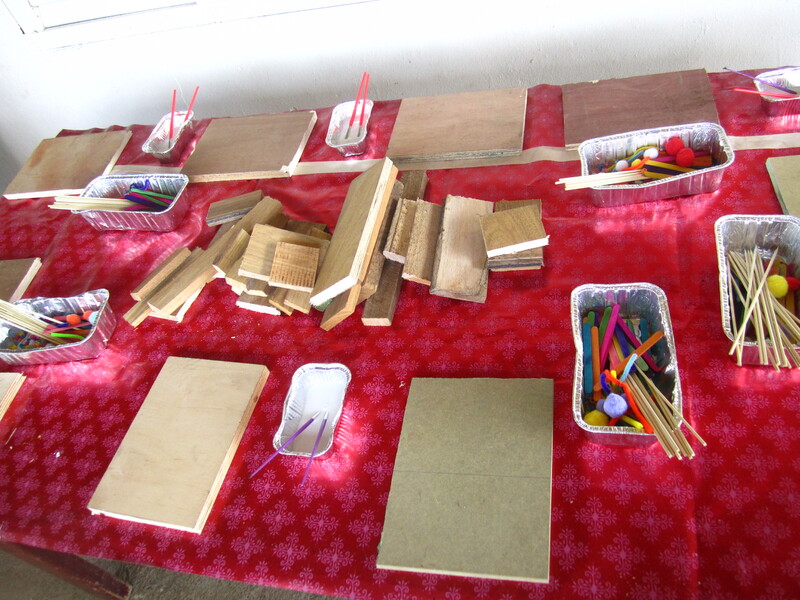 Renzo came to help us once the little ones were finished with their wood sculptures. 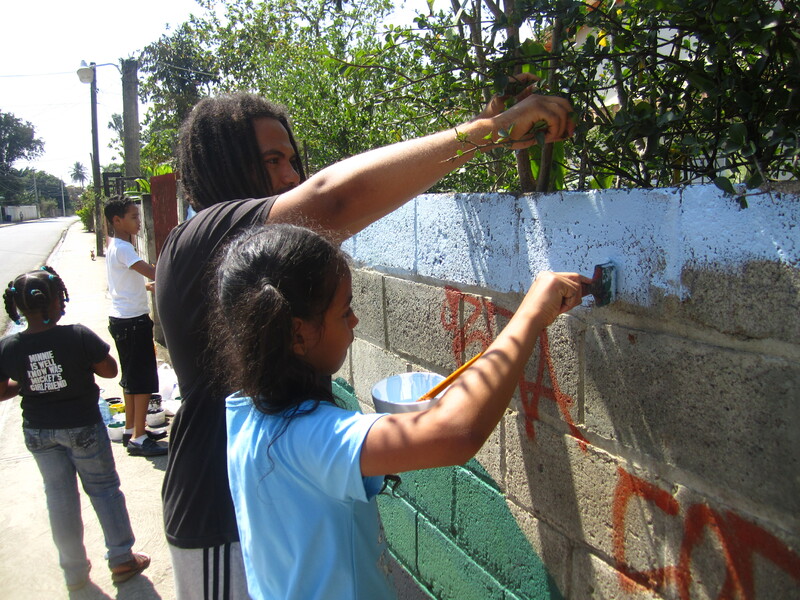 Watching Miguelina paint over the graffitti was pretty satisfying. I was there, really-just behind the camera and pouring paint the whole time! 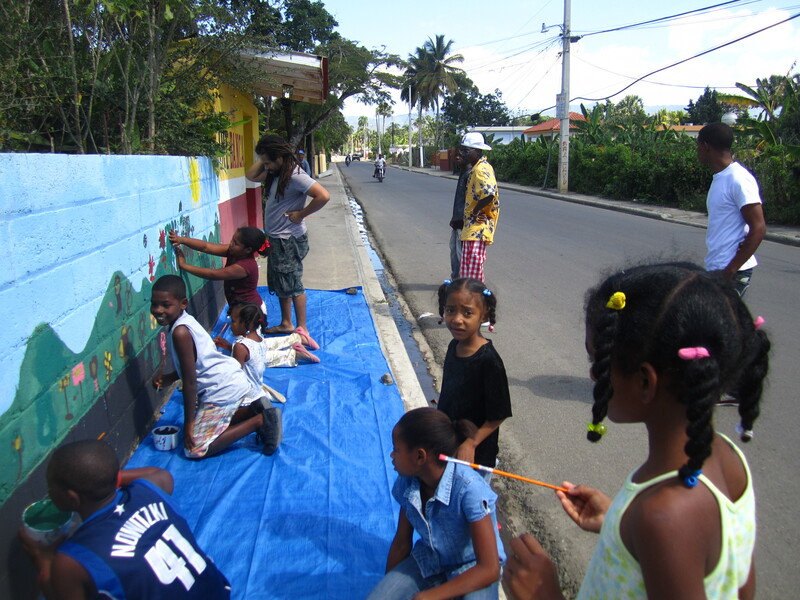 I am SO excited to see how the children’s mural evolves! I love the work they’ve done so far- I think this background is going to be a perfect framework for lots of incredible little details like trees, flowers, plants, animals, structures, people, etc. 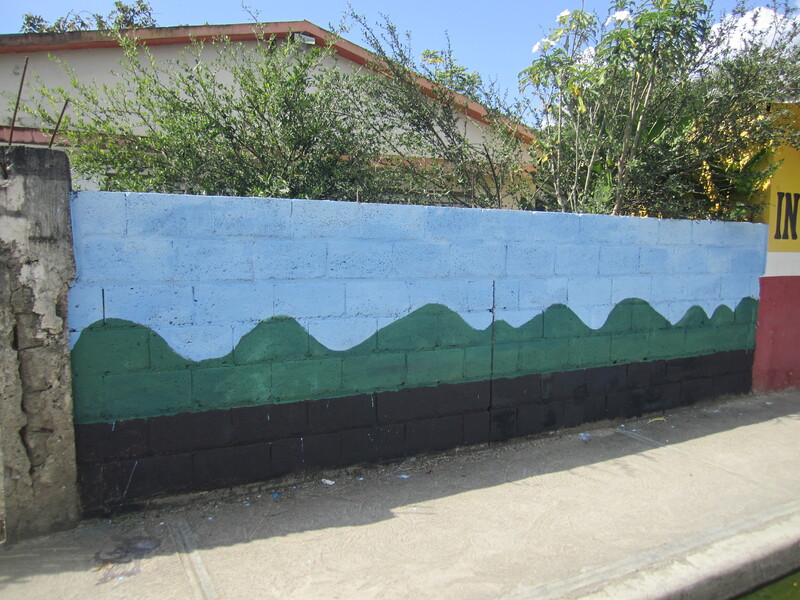 Their painting today is (and I quote Renzo) “already a big improvement”. I agree! It looks like such a pretty splash of color. I am really proud of the children and I hope they feel proud of their work too. We will be meeting this week to work more on the mural so there will be more updates coming soon!